John the Baptist’s ministry was vital for developing the climax of God’s revelation. The thread of Hebrew religious history had to be brought together to prepare a public that God’s Anointed could reach. John was not the light of God’s world. His task was to enable others to see the light. To be such a witness, John had to possess forcefulness, and at the same time to have a humility that rendered him unaware of how forceful he was. He knew that he himself was not God’s Messiah, yet he never imagined how great his own role was to be. John might wear the clothing of Elijah, but he did not claim the function of Elijah, or of any other prophet. All that he would profess to be was a voice to whom the Word of the Lord had been given. Even that Word had simply been handed down to him from Isaiah. The only commission he would claim for his baptism of repentence was the fact that he was preparing for a person whose anointing from the Lord was far more significant that his own. He cites Isaiah 40:3: “. . . prepare the way of the Lord” – implying that he is that text’s fulfillment. He administers a baptism of water to induce repentance and cleansing. But it is simply preparatory work; the figure for whom he prepares already stands among God’s people. As some, but not all, of the early manuscripts declare: The One who is greater than John will baptize with the empowerment of the Holy Spirit. John the Baptizer speaks to us today as an example of one who looked for the coming Deliverer and rejoiced at his appearance. The coming Christ is the one we anticipate in this season, and no one else. 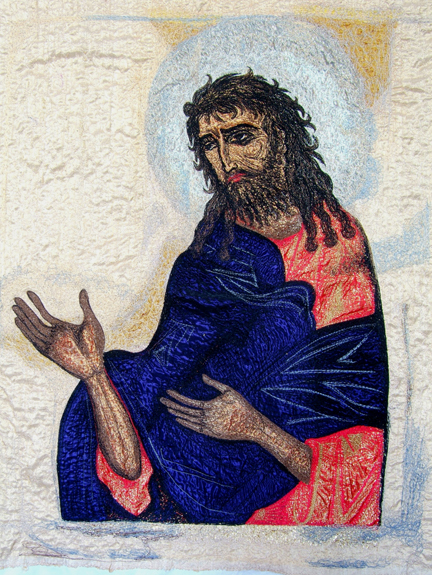 What is the ministry of John the Baptist as revealed in today’s reading? How does John explain his mission in response to the questioning of the priests and Levites? What is the “light” that John refers to 1:8? What is John’s relation to the light? What is our own relationship to the light? John came as a witness. How would you define the role of a witness in the sense that it is used here? How are we also called to be witnesses today? How doe today’s words from Isaiah 61 and 1 Thessalonians also reflect the mission of John the Baptist? As you consider the ministry of John the Baptist, how does he serve as a model for us today? This entry was posted in Advent, Baptism and tagged Baptism, Elijah, First Epistle to the Thessalonians, Jesus, John the Baptist, Lectionary, Prophets. Bookmark the permalink. keep up doing the good work. God bless you.